Rather a depressing opening for a post, isn't it? I think I should plant some vegetables in my garden. The problem is that I have a slipped disk and that prevents me from much garden work. Besides some laziness too... okay, I admit it. But let's stop beating around the bush: I loooove eggplant beignets, I find them one of the most wonderful side dishes or tapas one can serve. Hot straight from the pan, fried in a perfectly clean olive oil, they are excellent. 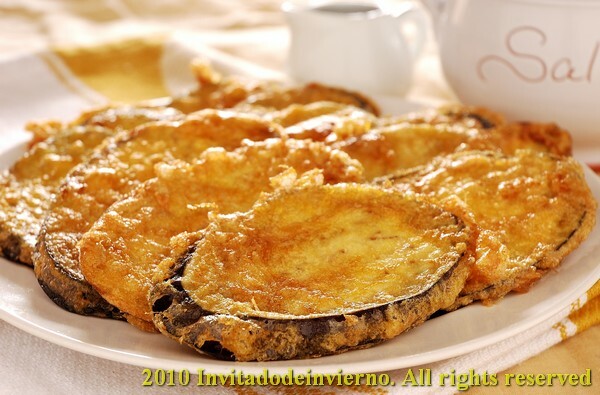 I remember to have eaten some of the tastiest eggplant beignets in my life in a small village hotel at Sierra Mágina, a beautiful massif covered with neverending olive groves in Andalusia, where we were treated like kings. They were cut into sticks, instead of sliced in rounds like mine, wonderfully crispy and drizzled with sugar cane syrup, like they're served all around Andalusia. I recall we stuffed ourselves that evening and we laughed our heads off with the children. The happiness effect of good food. Slice the eggplant in approximately 1cm thick slices. Place them in layers on a colander. Salt the slices in a layer thoroughly before placing the next layer on top. Leave them to rest for one hour so that they release their bitter juices. Pat them dry with a paper towel and rid them of all the juice (after an hour they'll be covered in little drops of juice). Pour olive oil in a large frying pan, at least 2cm deep (believe it or not, the more oil you use, the less oily the beignets will be). Heat it to medium-high. 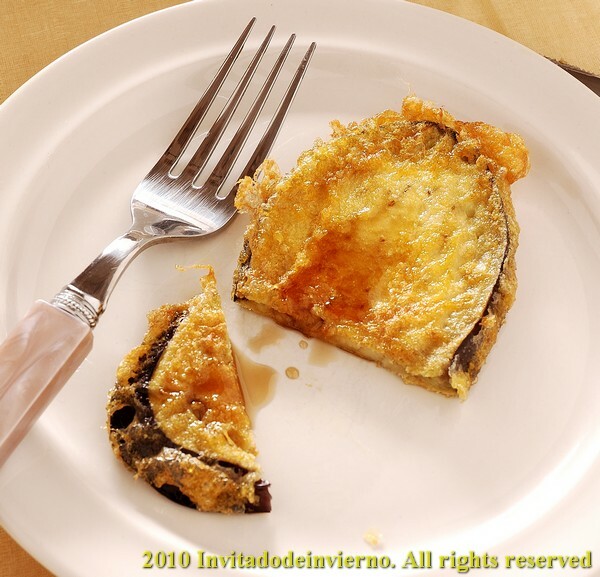 Coat the slices of eggplant in flour and then bathe them in the beaten egg. Fry them in batches. When golden, take them out to a large dish lined with paper towel, so that part of the oil is soaked. It's better to lay the slices in one layer till they're all done, because they get a bit soggy when left to cool one on top of the other. They should be crispy, more or less. Serve them immediately, while warm. Lovely sunny pictures from one of my favourite vegetables. And it brings back memories from our last Andalusian trip as well. Berenjenas con miel de caña has always been one of our favourite tapas. We had them sliced, but whether in slices or sticks they are incredibly delicious. So gorgeous! This reminds me of outdoor dinners...love it! my baby son is a little allergic to eggplant, not 100% sure, but since i've noticed that, i'm kinda against cooking with eggplant. 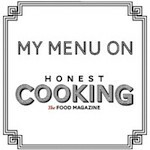 I think these eggplant beignets are very special and I would love to try them! Bookmarking to make very soon! I love eggplant, but frying makes me nervous. My oil always smokes, drys up quickly, and turns black. These make me want to try once more. They look delicious Miriam. We are starting to find more variety of eggplants at our farmers markets and grocers than ever before. This is so smart! Looks delicious! This looks so delicious and I love eggplants. Finding perfectly ripe eggplants is a challenge, but your beignets look delicious! Mmm mmm mm. That looks super delicious. It reminds me of something I had a lot when I went to Italy for some weeks. These are beautiful. They really look delicious. We had white eggplant (which taste almost the same as Black Beauty) growing out of control in my Mom's garden, and she lives in a city. They're very easy and inexpensive to grow in certain areas, and now is the time to plant I believe! I'm going out for tapas tonight- maybe these will be no the menu because they look so good! Yes, yes, yes! Gilded and fried - This is my favorite way to eat zucchini, as well. Wonderful photos, makes me want to dive right in. I would so go for this! 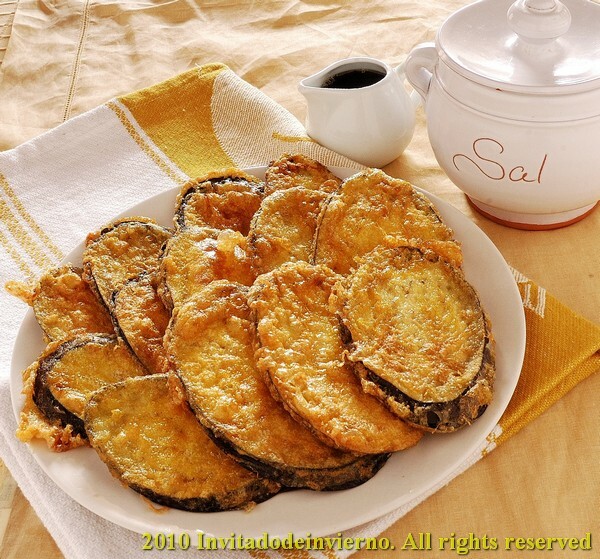 Love these eggplant beignets! This looks so simple yet so delicious. I love using chickpea flour for frying because it comes out so light and crispy. Ingrid: so you know the real thing! They are indeed delicious. Lululu: you should be careful then. Valen: if you use good quality olive oil that shouldn't happen! But don't let it overheat. Sarah: then you should try them! Val: you're lucky to have such a wide choice. Linn: I'm sure there must be something similar in Italy. Cleo: gilded... that's the word! Marc: it's simple, that's why it's best with really good eggplants.